When browsing through Costco’s Produce Section the other day, I came across a package of 4 large Portobello Mushrooms. These are the size that Mushroom Burgers can be made from and they are also great for a ‘Stuffed Mushroom Entrée’. After picking up the mushrooms, I then went over to the Seafood Section and purchased a King Crab Leg. The other ingredients that were needed were already at home. To make the Stuffed Mushrooms, the first thing that I did was remove the meat from the Crab Leg. King Crabs have unforgiving shells; there are little bumps or thorn-like protrusions on them that make it difficult to handle. The best way to do this is to take a pair of kitchen shears and cut the shell lengthwise from top to bottom. If this doesn’t help to split open the shell, do the same thing on the other side of the leg. You can then pull the shell apart and remove the meat. If you were lucky enough to have the meat come out in large pieces, you will want to cut them up into smaller pieces. You should have about 1 cup Crab Meat. You will also need about ¼ cup of chopped Onion and ¼ cup of chopped Celery. Remove and discard the stems from the Portobello Mushrooms. Wipe the Mushrooms off with a damp paper towel and place them skin side down in a baking dish. To make the stuffing, melt about 2 Tablespoons of Butter in a sauté pan and then add the chopped onions and celery. Sauté the vegetables in the butter until they are limp and the onion just start caramelize. Then add 2 Tablespoons of Flour and stir into the Butter. Once a paste forms, stir in 1 cup of milk or half and half and continue to cook and stir until the mixture thickens. Add about ¼ tsp. -1/2 tsp. Salt and ¼ tsp. White Pepper. Taste and adjust the seasonings if necessary and then stir in the prepared Crab Meat. This preparation is enough to fill two large mushrooms. Top the mushrooms with shredded Parmesan or Mozzarella Cheese. Place under the broiler for about 5 minutes or until the tops become lightly browned. Then place on a lower rack in the oven and continue baking for about 5 minutes more. Serve with a vegetable or green salad. Our mushroom dinner was served with very young asparagus that I sautéed with just a tiny amount of water and sea salt and then drizzled with mushroom oil. Garlic bread was the final addition. This makes a very rich and filling meal. If you are preparing this meal for 4 people, just double all the ingredients mentioned above. If you are only preparing it for two people, then you are going to have two large mushrooms left over. On another night, you can make Mushroom Burgers. 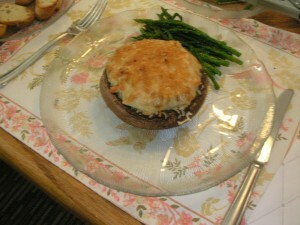 Keep posted to this blog to look for the directions for the Mushroom Burgers. When you make your stuffed mushrooms, don’t feel that you have to stuff them with crab. You can use just about anything else that you prefer, including spinach, tofu or chopped mushrooms. Use your imagination and see what you can come up with.